Evidentially, a large portion of this country has been busy breaking all sorts of heat records for June. National Weather Service meteorologist Jim Keeney reported in the New York Times two weeks ago that much of the U.S. is experiencing conditions that we normally don’t have until August. “The heat has been pushed north all the way into Wisconsin, and in the North especially, we are seeing temperatures 15 to 20 degrees above normal,” said Keeney. Allow me to set the record straight. I can assure you that this “brutal heat wave” has not, in any way, shape or form, found it’s way past the Mason-Bibon line on into Northern Wisconsin. The south shore of Lake Superior has been officially chilly, wet, and grey for pretty much the last three weeks. I think there might have been a day in early June when the thermometer pegged at 66ºF, but it was so short lived, it’s hard to recall. The sun is out today, but we’re still hovering in the upper 50’s. 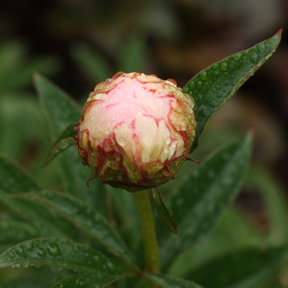 My peony bush has been poised and ready to bloom since the end of May, but it simply refuses budge in this weather. I go out and look at it every morning. And every morning, it looks the same. I can pretty much hear it. “No! I won’t!” I guess I don’t blame it. I haven’t exactly been frolicking around outside either. My first summer beach read of the season was devoured under the weight of two down comforters. I can guarantee you that my sweet corn will nowhere near be knee high by the Fourth of July. Even the snap peas, who prefer it nice and cool, look miserable. They are slowly inching their way up the trellis – more out of duty than anything. Don’t even ask about the peppers. They are stuck in a wallow of self-pity. Really, the only thing in the garden that seems genuinely pleased with the current state of affairs is the spinach. But hey, I’ll take it. It’s been a cold, misserable, rainy June. At least I’ve got spinach to show for it. My routine of late involves slogging out to the garden during breaks in the rain to keep the spinach picked and give the rest of the garden a rousing pep talk. 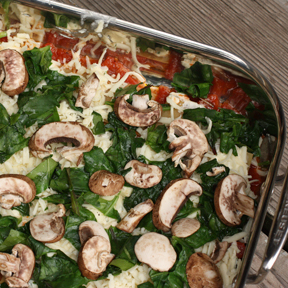 I came in the other day with a big basket of fresh spinach, mixed with a few handfuls of tender little lamb’s quarter leaves, thinking that a steamy pan of lasagna would do nicely to take the chill off. Only I wasn’t sure if I had the energy to construct it. I like lasagna, but to be honest, I find it a bit exhausting. Generally by the time I am done, I have dirtied just about every dish in the house, the kitchen is a mess, and I barely have the strength left to eat. Still, my taste buds were having trouble pushing the notion of fresh spinach lasagna out of my mind. I quickly ran through the process in my head, searching for ways to simplify. No boil noodles, jarred pasta sauce, layer the veggies in raw, skip the Béchamel sauce. I rallied. 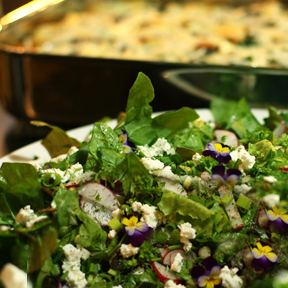 Let the spring spinach chronicles continue. In the end though, I caved on several of my proposed simplification techniques. The mushrooms went in raw, but I did end wilting the spinach just slightly. It cost me another pan, but when I looked over a the heaping mound of raw spinach I was concerned it would be too bulky and unruly to layer into the pan. I could have opened a jar of pasta sauce, but I had some canned plum tomatoes too. I knew I couldn’t beat a simple sauce made with olive oil and fresh green garlic. Damn. Another pan. And how could I not use a white sauce with crimini mushrooms and all that fresh spinach? It would be a crime. What’s one more pan? But by golly, I held my ground with the no-boil noodles. One pot and one colander, saved! The recipe looks long, but it’s really not so bad – especially considering that you end up with enough food to last you through the week, or to invite a few friends over at the last minute – which is what we did. I promise that it’s worth the couple of extra pots and pans (this coming from a woman who does not have running water). And it’s a perfect celebratory, feel-good kind of meal. Tuck it in your back pocket for a cool summer’s night dinner on the porch, or for fall – if you happen to be lucky enough to live somewhere that actually gets warm, or dare I even imagine…HOT. Warm the olive oil in a sauce pan and and add the garlic, red pepper, and salt. Saute briefly until the garlic is just tender, but not brown. Add the tomatoes, juice and all and gently simmer for about 20-30 minutes until the sauce thickens up to your liking. Adjust the seasoning as necessary. Melt the butter in a small heavy saucepan. Slowly stir in the flour, mixing with a fork or whisk. Keep stirring for 1 -2 minutes until the mixture just starts to brown and smells fragrant. Keeping stirring as you add the milk. Cook over medium heat, stirring often until the mixture thickens up, about 5 to 10 minuets. Remove from heat and season with salt, pepper, and a dash of fresh nutmeg. Pour a thin layer of the red sauce in the bottom of your baking dish. Follow with a layer of noodles, 1/3 of the ricotta mixture, 1/3 of the spinach, 1/3 of the mushrooms, 1/3 of the white sauce, and 1/3 of the grated cheese. Repeat the process to make 3 layers, ending with the grated cheese. Bake in a 350ºF oven for about 40 minutes until the cheese is bubbly and slightly browned. Remove from oven and sprinkle with 1/2 cup fresh grated Parmesan cheese. Let stand 10 – 15 minutes before slicing. I had my first Dark Days cooking flop of the challenge last week. I’ve been struggling to come up with a few more vegetarian options for our 50-mile radius meals. Don’t get me wrong, I love our local meat. I feel so lucky to have a freezer full of pork, chicken, beef, lamb, and bison – all raised by people I know, trust, and respect. But it seems like most of our weekly Dark Days meals are meat-centric. And as a former vegetarian, I still harbor a penchant for meatless chow. The DD challenge has got me realizing that with the exception of wheat, we don’t really have anyone in our neighborhood producing dry beans or other grains. With that in mind I decided I had better embrace the one grain I can get locally. I set out to create a hearty wheat berry salad. Picture roasted pumpkin cubes dressed in maple syrup with pinches of cardamon and cinnamon. Mix in some garlic sautéed in saffron butter, toss with the warm wheat that has been simmering in homemade veggie stock all day, and top it off with a heap of caramelized onions. Oh, and maybe add a few little smudges of local chev to each bowl before serving. I was feeling pretty cozy just dreaming it up. In an effort to try something extra good for us, I decided to sprout my wheat berries a few days before making the salad. 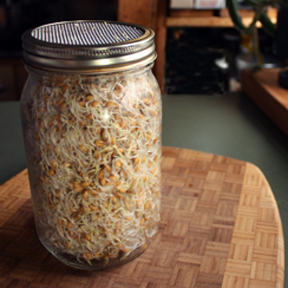 According to Sally Fallon – who has yet to steer me wrong – spouted grains and seeds are substantially healthier for us. In her book Nourishing Traditions, she says that the process of germination produces vitamin C, increase vitamin B content, and can raise the carotene level up to eight times that of unsprouted grain. Reading this bit of news really got me going. It’s the middle of February in northern Wisconsin, bring on the carotene! Fallon goes on to explain that even more importantly, sprouting neutralizes the phytic acid found in the bran of all grains which inhibits the absorption of all sorts of good minerals (calcium, magnesium, iron, coper, and zinc). And if that’s not enough, she also tells us that the spouting process creates a number of good digestive enzymes. What’s to lose, I think? I soaked my canning jar of wheat berries over night, drained them in the morning, and proceeded to tend them diligently for the next 2 days. Which basically meant giving them a rinse a few times a day and turing the screen lidded jar back upside down to drain and breathe. Extra health benefits or not, it was absolutely thrilling to have something living and growing in the kitchen windowsill. And perhaps my zealous green thumb is what got me into trouble. I think I over sprouted. I refrigerated the sprouts after just 2 days, even though the instructions said it would take 3 or 4. In retrospect, they did seem a little lanky, but when it came time for Dark Days Meal 10, I proceeded as planned and followed Fallon’s cooking instructions of a slow oven simmer. All afternoon a cross between the smell of freshly baked bread and simmering stew wafted up the stairs to my office. When I couldn’t stand it any longer, I went down to taste the wheat. Here’s where the trouble started. The flavor was good, but the texture was chewy. I mean really chewy. No amount of masticating seemed to break down the sprouted ends of the wheat. Maybe it was just me, I thought, and hopefully returned the pot to the oven. But when Mark got home from work, I did the ultimate test. I gave the man who will eat nearly anything without complaint a bite and waited for his reaction. He was nice enough about it, but I knew I was going to have to switch gears for Meal 10. We were down to the wire on time and I need something quick. So I made the culinary leap from Maple Hill Road in Washburn, WI all the way to South America and grabbed one of my favorite grains off the pantry shelf – quinoa. It’s light, it’s fluffy, it’s nutty, it cooks up in 20 minutes. Perfect. Except suddenly my sweet pumpkin, garlic, and caramelized onion concoction seemed too heavy. I had also roasted a tray of beets that afternoon, which were now quietly resting in a splash of olive oil and red wine vinegar. These seemed like a better fit. With the exception of the quinoa, I kept things mostly local, but I did get a little carried away with the dressing. Since I had to leave my big, bold pumpkin behind, I comforted myself with something tangier and more perky. Which means I added lemon juice and fresh ginger to the dressing. And then, at the last second, I couldn’t resist tossing on a few bright green pistachios that I had on hand. Just the sight of them mingled with the pink beets made me a little less glum about my sprouted wheat debacle. I still plan to try my “pumpkin berry” salad and will even give the carotene packed sprouted wheat a second chance. I checked back and Fallon does say not to let the sprouts get beyond 1/4 inch. So I’m guessing that’s where I went wrong. I felt like I should have jumped right back on the indigenous horse and done something particularly noteworthy for Dark Days Meal 11, but Mark and I were both rebounding from mid-winter colds. We were tired and unenthusiastic. 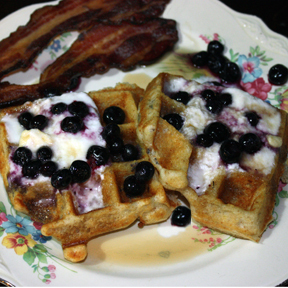 Nothing sounded better than a plate of blueberry waffles with a side of thick, Hermit Creek Farm bacon. Even though I had local flour and milk on hand, I was feeling so lazy that I opted for the jar of Sturdiwheat pancake & waffle mix from the pantry – which is actually somewhat local, especially coming from my mom, who lives just down the road from Red Wing, MN where it is made. And I have to say that the mix beats out many of the recipes I have made from scratch. Sturdiwheat blends some of the outer wheat bran back into the mix, which yields an especially flavorful waffle. To make us feel even better, I served them on my grandma’s prettiest flowered plates. Beets and shallots (cold storage, via our garden), chev cheese (Sassy Nanny, 30 miles), quinoa (most likely South America), olive oil, ginger, lemon juice and coriander. Wash and trim one pound of beets. Leave part of the top and skin intact. Put whole beets in a covered baking dish, adding enough water to cover the bottom of the dish to about 1/8th inch. Cover and bake in a 350º F oven until beets are tender – about 45 minutes to an hour. Uncover, cool, cut off what is left off the tops and slip off skins. Cut bets into wedges or cubes and sprinkle with 1 teaspoon of red wine vinegar and a dash of salt. Let stand a bit and then toss with about 2 teaspoons of olive oil. Bring 1 cup quinoa and 2 cups water to a boil, reduce heat, cover, and simmer about 20 minutes until water is gone and quinoa is tender. Set aside. In a large bowl, stir together the quinoa and beets, pour dressing over stir to combine. 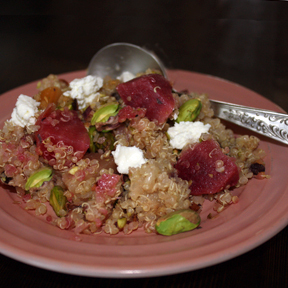 Sprinkle with toasted pistachios and crumbled goat cheese. Sturdiwheat (Red Wing, MN, 208 miles – or 18 miles for my mom), blueberries (Blue Vista Farm, 2 miles), yogurt and cultured buttered (homemade from Tezner’s milk and cream, 15 miles) maple syrup (Andy and Linda’s sugarbush 19 miles), bacon (Hermit Creek Farm, 29 miles). 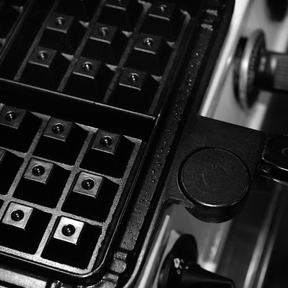 Top piping hot waffles with butter, yogurt, blueberries, and maple syrup. I know I said I have the southern cooking bug, and I do. I even made a trip to Sixth Street Market this week (a gem of a butcher shop that northern Wisconsin is lucky to have) and got some gorgeous shrimp so I could try my hand at Shrimp and Grits. But then, I got seriously sidetracked. I shamelessly used my southern bound shrimp for a dish I can never resist – Pad Thai. Often thought of as one of Thailand’s national meals, Pad Thai is a relatively simple noodle dish that has the perfect blend of sweet, sour, savory, slight saltiness, and varying degrees of spiciness. It’s my go to order when I find myself in an Thai restaurant. It can vary widely from chef to chef, and while I’ve had some that I like better than others, I’ve yet to dive into a bowl of Pad Thai that I haven’t thoroughly enjoyed. It’s hard to screw up stir fried noodles. Many years ago, my dad gave me a slim little book called Seven Wonders: Everyday Things for a Healthier Planet. After an honest introduction that leaves you feeling pretty much disgusted to be a part of the over indulgent American society, author John Ryan goes on to list seven forward thinking tools to help us reduce our ecological wear and tear on the planet. Unlike most American consumption habits, Ryan’s theory is that these seven items can be used by everyone on Earth without overtaxing our planet’s resources. Ryan proposes that the world as whole should make better use of the following items: the bicycle, the clothesline, the condom, the ceiling fan, the public library, the ladybug, and – of all things – Pad Thai. Ryan reasons that Pad Thai is a sustainable wonder because, like a lot of Asian food, it consists mainly of rice noodles and vegetables – which is friendlier on the planet and our bodies than the typical meat based American meal. In general he encourages us to eat more plant and grain based meals and less meat (particularly grain-fed meat). He cites plenty of other other ethnic cuisines that environmentally beat out the majority of American fare – Italian based pasta dishes, South America’s heavy use of corn, quinoa, and other grains, and Asian inspired rice meals. But I think his decision to highlight Pad Thai as a leading example of sustainability is a splendid one. It’s hard to find a more flavorful dish. I’ve tried handfuls of Pad Thai recipes over the years – even one from my favorite, but now sadly defunct, Thai restaurant in Saint Paul (White Lily). But I keep coming back to a recipe that I clipped years ago from the back of a package of rice noodles as my home base. (In my book, packaging recipes are a valuable source that should never be overlooked!) 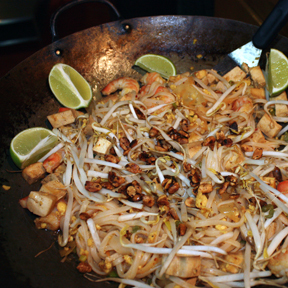 As if saving the planet isn’t enough, the other brilliant aspect of Pad Thai is that it’s quick. 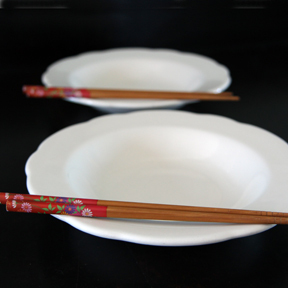 I can have it on the table, chopsticks at the ready in under a half hour. 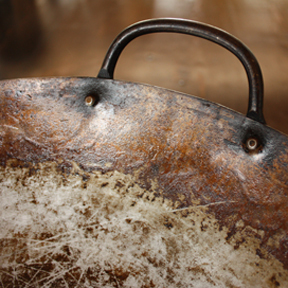 Whats more, I get to use my hand hammered wok – one of my favorite pieces of cookware. What I put into my Pad Thai tends to vary depending on what I have on hand. Rice noodles, eggs, bean sprouts, and the sauce are pretty much the only constants. I almost always use tofu and in the summer I am prone to toss in a big handful of broccoli or cabbage. I rarely use other meat or shrimp, but once I got my grits designated shrimp home, I couldn’t resist making an extra special Pad Thai. Luckily, I can rest easy knowing that when I do get around to those Shrimp and Grits, I’ll be eating another earth-friendly, grain-based meal (shrimps aside of course). I generally start by throwing about 1/2 cup of raw peanuts into a hot, peanut-oiled wok with a little garlic, salt, and dried chili pepper tossed in. I stir fry these over medium-low heat until they are toasty and fragrant. Then I drizzle a little honey over them and remove them to a plate to get cool and crunchy. Raw or plain roasted peanuts will do in a pinch, but I think it’s worth the extra effort in the end. Cook 8-10 ounces rice noodles according to the package directions, drain and rinse with cool water. Keep these handy next to your wok. While the noodles cook, mix together the sauce in a small bowl or measuring cup. I like to get everything chopped and at the ready before I heat up the wok. 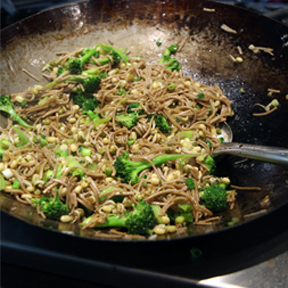 Heat wok (or large skillet) over medium heat and coat generously with 1 or 2 tablespoons of peanut oil. Add the minced garlic and saute briefly. After a few minutes, add in the egg and place the shrimps around them. Stir continuously until the eggs start to firm up. Add in the scallions and (if using) the broccoli. Stir fry 3 to 4 more minutes until the shrimp are pink. Toss in the tofu and radishes and stir fry a few times to mix. Add in the rinsed noodles and pour the sauce over the noodles. Stir fry and mix until most of the sauce is absorbed, about 3 – 5 minutes. 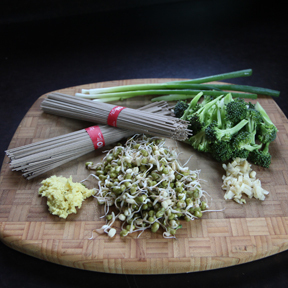 Remove from heat and toss in the bean sprouts and most of the roasted peanuts. Garnish with lime wedges, red pepper flakes, and remaining peanuts. * A note on the tofu: I usually cube it and toss it in a baking dish with a little soy sauce, garlic, olive oil and fresh ginger. Then I let it marinate for a while, or ideally bake it in a 300º F oven for a bit to let the goodness soak in. If nothing else, splash a little soy sauce on your tofu before you add it to the wok.